Own One Piece - Chopper Plush (With Vibrate Function) 30 cm from Deff, DVD, Blu-Ray & 4K Video Specialists - Free UK Delivery..
Own One Piece - Crew Door Poster 53 x 158cm from Deff, DVD, Blu-Ray & 4K Video Specialists - Free UK Delivery..
Own One Piece - Luffy Giftset (Glass 29cl + Keyring + Mini Mug) from Deff, DVD, Blu-Ray & 4K Video Specialists - Free UK Delivery..
Own One Piece - Luffy Giftset (Mug 320ml + Keyring + Notebook) from Deff, DVD, Blu-Ray & 4K Video Specialists - Free UK Delivery..
Own One Piece - New World Giftset (Mug + Keychain + Badges) from Deff, DVD, Blu-Ray & 4K Video Specialists - Free UK Delivery..
Own One Piece - Skull Cushion from Deff, DVD, Blu-Ray & 4K Video Specialists - Free UK Delivery..
Own One Piece - Skull Luffy Flag 70 x 120cm from Deff, DVD, Blu-Ray & 4K Video Specialists - Free UK Delivery..
Own One Piece - Skull Luffy Giftset (Wallet + Keyring) from Deff, DVD, Blu-Ray & 4K Video Specialists - Free UK Delivery..
Own One Piece - Skull Luffy Metal Plate 28 x 38cm from Deff, DVD, Blu-Ray & 4K Video Specialists - Free UK Delivery.. When the Straw Hats catch wind of trouble in the peaceful waters of the East Blue, they quickly set a course for home! But before they reach their destination, fate leads them into the deadly path of Golden Lion Shiki. This gravity-defying madman needs a navigator, and he wants Nami! Shiki scatters the Straw Hats across the far corners of a floating island filled with ferocious, genetically-mutated monsters, and issues Nami and ultimatu..
Luffy and Crew’s First Animated Movie In English! From the director of the Digimon Frontier anime movie! The kingdom of Alabasta is about to erupt in civil war - a war engineered by Crocodile, one of the Seven Warlords of the Sea, and his criminal organization Baroque Works. Monkey. D. Luffy, his Straw Hat Crew, and Princess Vivi race to the island, where the strongest warriors of Baroque Works wait to stop them. Can Vivi and her friend.. The Straw Hats face their toughest opponent ever in the latest theatrical adventure from one of the world’s most beloved franchises! When Luffy and his crew rescue a drowning man, they have no idea what manner of evil they just welcomed aboard! The mysterious stranger turns out to be the former marine, Admiral Zephyr: a rampaging madman with a devastatingly deadly right arm called Battle Smasher. Better known as Z, this grief-crazed ha..
Own One Piece - The Movie - Z DVD from Deff, DVD, Blu-Ray & 4K Video Specialists - Free UK Delivery..
Own One Piece - Wanted Giftset (Mug + Keychain + Badges) from Deff, DVD, Blu-Ray & 4K Video Specialists - Free UK Delivery..
One Piece Movie 7: Mega Mecha Soldier of Karakuri Castle Having recovered a treasure chest from a sinking ship, the Straw Hat Crew can not wait to see what riches await them inside. Instead of treasure, they pulled out an old lady. Anxious to get back home (and avoid Nami's wrath for having thrown out the treasure previously in the chest), the old lady offers a great treasure reward if the crew will return her to her home on Mecha Islan..
Own One Piece (Uncut) Collection 18 (Episodes 422-445) DVD from Deff, DVD, Blu-Ray & 4K Video Specialists - Free UK Delivery..
Monkey D. Luffy is a boy with big dreams. This daring rubber-man refuses to let anyone or anything stand in the way of his quest to become king of all pirates. 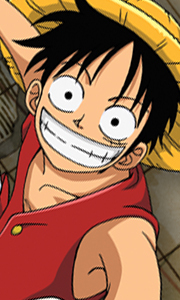 With a course charted for the treacherous waters of the Grand Line, Luffy strikes out in search of a crew - and a boat. Along the way he'll do battle with scallywag clowns, fishy foes, and an entire fleet of marines eager to see him walk the plank. The stakes are high, but with e..
Own One Piece - Collection 10 Episodes 230-252 DVD from Deff, DVD, Blu-Ray & 4K Video Specialists - Free UK Delivery..
Own One Piece - Collection 11 Episodes 253-275 DVD from Deff, DVD, Blu-Ray & 4K Video Specialists - Free UK Delivery..
Own One Piece - Collection 12 Episodes 276-299 DVD from Deff, DVD, Blu-Ray & 4K Video Specialists - Free UK Delivery..
Own One Piece - Collection 13 Episodes 300-324 DVD from Deff, DVD, Blu-Ray & 4K Video Specialists - Free UK Delivery..
Own One Piece - Collection 14 Episodes 325-348 DVD from Deff, DVD, Blu-Ray & 4K Video Specialists - Free UK Delivery..
Own One Piece - Collection 15 Episodes 349-370 DVD from Deff, DVD, Blu-Ray & 4K Video Specialists - Free UK Delivery..
Own One Piece - Collection 16 Episodes 371-393 DVD from Deff, DVD, Blu-Ray & 4K Video Specialists - Free UK Delivery..
Own One Piece - Collection 2 Episodes 27 To 53 DVD from Deff, DVD, Blu-Ray & 4K Video Specialists - Free UK Delivery..
High adventure on the treacherous seas! The Straw Hats are headed for the treacherous Grand Line in search of a genuine pirate adventure! But before their journey begins, they discover a strange little girl with a fleet of angry Marines hot on her trail. The merry pirates are badly outnumbered and the canon balls are getting dangerously close, but Monkey D. Luffy never deserts a mate in need. Even when it means crossing paths with angry..
Own One Piece - Collection 4 Episodes 79-103 DVD from Deff, DVD, Blu-Ray & 4K Video Specialists - Free UK Delivery.. Deadly Desert Showdown The Straw Hats crossed a desert to defend the kingdom of Alabasta, but the real adventure is about to begin! Crocodile and his army of assassins set their sights on King Cobra's empire, Luffy and his mates get locked in the clink, and a regal imposter leads Vivi's people towards a bloody uprising. Lucky for Luffy, Sanji and Chopper are still on the loose, and they've got a plan to spring their captain from the jaw.. When your boat doesn't float. Fresh off their adventure in Alabasta, The Straw Hats prepare to sail straight into the sky in this uncut, unedited twenty-six episode collection! After a death-defying adventure in the dire and dangerous Rainbow Mist, Luffy and his crew dock at Mock Town in search of directions, but instead they're brutally bullied by pirates who've forgotten how to dream. Fortunately for the sake of adventure, Nico Robin ..
Own One Piece - Collection 7 Episodes 157-182 DVD from Deff, DVD, Blu-Ray & 4K Video Specialists - Free UK Delivery..
Own One Piece - Collection 8 Episodes 183-205 DVD from Deff, DVD, Blu-Ray & 4K Video Specialists - Free UK Delivery..
Own One Piece - Collection 9 Episodes 206-229 DVD from Deff, DVD, Blu-Ray & 4K Video Specialists - Free UK Delivery..
Own One Piece - The Movie - The Pirates And The Princess Of The Desert DVD from Deff, DVD, Blu-Ray & 4K Video Specialists - Free UK Delivery..
Own One Piece Movie Collection 1 - Films 1 to 3 DVD from Deff, DVD, Blu-Ray & 4K Video Specialists - Free UK Delivery..
Own One Piece Movie Collection 2 - Films 4 to 6 DVD from Deff, DVD, Blu-Ray & 4K Video Specialists - Free UK Delivery..
Own One Piece Uncut Collection 17 DVD from Deff, DVD, Blu-Ray & 4K Video Specialists - Free UK Delivery..